Oh, I can’t believe it has been four months since my last Share and Tell blog. I’ve had lots of gorgeous photos sent in and it’s my absolute pleasure to share them with you now. If you read my last blog you would have seen the alternative way the Teri has been making my frill hat. Well this is some more of Teri’s work and as you can see she is sewing for her childhood doll which is a little bigger than the 18 inch American Girl doll so she has been altering the patterns accordingly. My doll is not an American Girl doll, so I am having to adjust the patterns slightly. Here are the Sports Shorts and modified Crop Top that I completed today. I am excited to see the finished product so quickly! You really do make it easy. Rosie, here is the latest outfit I just finished today. I had to shorten the straps to fit this doll. I also made the sweetest underpants for her…something this 50+-year-old doll really needed. The tights are my next project. I’m sorry to keep peppering you with emails, but I am so excited to see the finished hat. I just had to show you the completed outfit. I never dreamed I could sew like this. Thank you for your excellent guidance. You have given me such confidence. And one more from Teri. Here is my first attempt at the 50’s Vintage Dress pattern. I only had to lengthen the bodice a bit to fit this 20″ doll. I really love this pattern…so many possibilities! Thank you, Rosie! I am having so much fun and learning a lot with your video tutorials. Thank you for providing such thorough, clear instructions. Your recent price reduction and added discount gave me the incentive to give it a go…and I am so glad I did! 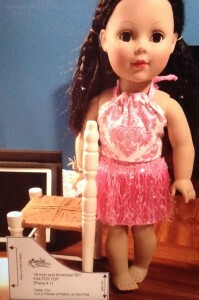 I’m so thrilled to see Teri having so much fun and making such gorgeous outfits for her pretty doll. She’s doing a wonderful job. 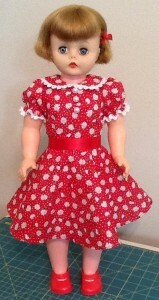 Do you remember Frances’ cute Bimbambola 18 inch doll from a few Share and Tell blogs ago? 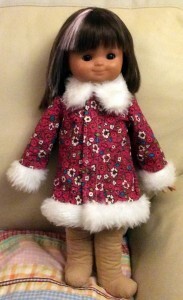 Well, Frances has been busy again making Bimbam a lovely new Fur Trimmed Jacket and Vintage Dress. I think Bimbam is super happy with her new clothes. Erica has made a cute crop top and long pants for her doll. Loving the groovy fabric used for the long pants. 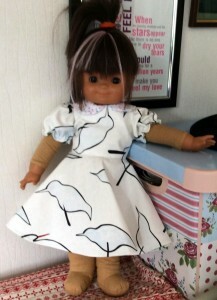 Here is a picture of my doll with the pattern I have bought from you. The templates and instructional videos are great and I am learning all the time. 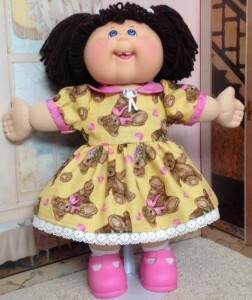 Here is a picture of my niece’s Cabbage Patch Kids Doll Natalie modelling her new outfit. The tutorial videos were very helpful in finishing the pattern, thank you! Cindy posted these photos on my Facebook page and I just had to share them here. Made a cute dress for Elenor using your 50’s dress pattern. Yes I think it’s very cute Cindy and you did a great job highlighting the pink in the fabric with the pink collar and trim on the sleeves. The pink shoes complete the outfit. I just had to include this last photo and message from Leevonora as it got my heart is singing the day I received it. Helping people achieve their dreams is just so wonderful and I feel totally blessed to be doing what I’m doing. I can’t begin to tell you how happy I am. I have wanted to sew doll clothes for my granddaughter and myself for about 5 years now, but could never understand the directions in the patterns. It was so frustrating. Then I found you on YouTube. 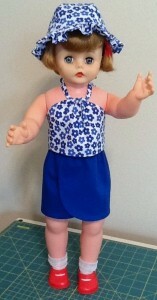 I purchased How to Sew Doll Clothes Course and 7 of your patterns. Now I am sewing to my heart’s content, and with great results right from the start. I am enclosing a photo of my second outfit. You changed everything Rosie. How can I thank you? So grateful to you. You are doing what no other pattern company has had enough sense to do. You go Rosie! Thanks to everyone for sending in your photos and stories, I know we all love to see what you have been creating and reading about your sewing adventures. Hi Rosie. The photos are gorgeous and the praise very well deserved. My (almost 10yr old) grand-daughter is just starting to enjoy learning to sew and saved up her money to buy an 18in doll for her model. I’ll send some pictures when we have something to show you. Cheers. Would love to know where you get the shoes for the cabbage patch doll. Clothes look wonderful. 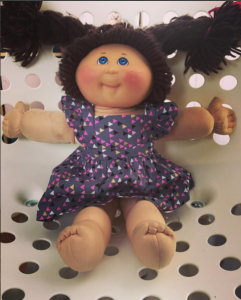 I’ve only ever seen the original Cabbage Patch doll shoes available at the official Cabbage Patch website or second hand on Ebay. Perhaps Cindy can tell us where she got her shoes. I have some shoes available on my doll clothes website that fit the Cabbage Patch doll. You can find them here.